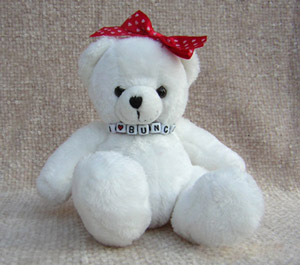 This official I Love Bunco™ Bear will become the mascot for your Bunco group. The Party Bunco®"I Love Bunco™" Bear has made a come back due to popular demand. When the Bunco enthusiasts rolls three of a kind it is time to yell BUNCO !!! Like all the past Bunco Bears ... we are special!!! Order now while they last.